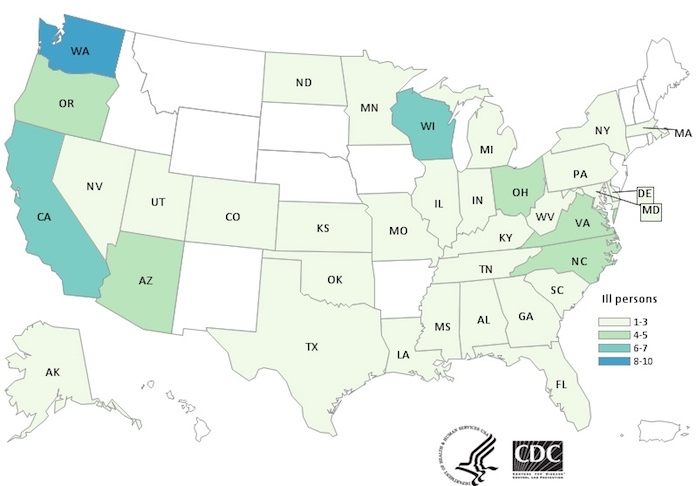 The multistate outbreak of Salmonella infections linked to kratom products has grown to 87 sick in 35 states. That is an increase of 47 more ill persons since the last update on March 2, 2018 and the addition of eight states. The states added to the outbreak count include Alaska, Illinois, Indiana, Maryland, Mississippi, Nevada, Texas, and West Virginia. The outbreak also now includes three more strains of Salmonella: Salmonella Javiana, Salmonella Okatie, and Salmonella Thompson, in addition to the original strain of I 4,,12:b:-. The outbreak strains have been found in samples collected from kratom and from ill persons. Twenty seven people, or 38%, of patients have been hospitalized. That is double the normal hospitalization rate for Salmonella outbreaks, which is 20%. The case count by state is: Alaska (1) Alabama (1), Arizona (4), California (6), Colorado (2), Delaware (1), Florida (3), Georgia (2), Illinois (2), Indiana (1), Kansas (1), Kentucky (3), Louisiana (1), Massachusetts (2), Maryland (1), Michigan (3), Minnesota (2), Missouri (2), Mississippi (1), North Carolina (4), North Dakota (1), Nevada (1), New York (2), Ohio (4), Oklahoma (3), Oregon (4), Pennsylvania (2), South Carolina (1), Tennessee (1), Texas (1), Utah (3), Virginia (4), Washington (10), Wisconsin (6), and West Virginia (1). Illnesses started on dates ranging from January 1, 2017 to February 24, 2018. The patient age range is from 6 to 67 years. No deaths have been reported. No common brands or suppliers of kratom products have been identified at this time, although some brands distributed by PDX Aromatics have been recalled. Because of this, the CDC is telling consumers they should not consume kratom in any form. Officials are still collecting various leftover and unopened kratom products to test for contamination. Investigators are also interviewing patients and asking them where they purchased the product. Outbreak strains of Salmonella Okatie and Salmonella Thompson were fond in samples collected from retail locations and online retailers by Oregon and Utah public health officials. The symptoms of a Salmonella infection include fever, abdominal pain and cramps, nausea, vomiting, and diarrhea that may be bloody. Most people recover without medical treatment, although some may become so ill from sepsis or dehydration that they must be hospitalized. If you have used kratom products and have experienced these symptoms, see your doctor. If you or a loved one have been sickened with a Salmonella infection after consuming kratom products, contact our experienced attorneys for help at 1-888-377-8900. Pritzker Hageman, America’s food safety law firm, successfully helps and represents people hurt by adulterated foods in outbreaks throughout the United States. Its lawyers have won hundreds of millions of dollars for foodborne illness patients and their families, including a multimillion dollar verdict for a child harmed by Salmonella bacteria. Pritzker Hageman lawyers are often interviewed as experts on the topic by major news outlets including the New York Times, CNN, and the Wall Street Journal. The firm also represents people harmed by pathogenic microorganisms in Legionnaires‘ disease, surgical site infections, and product liability cases.